"New Challenges of the Intraparty Diplomacy"
On September 28-30, Yerevan hosted a seminar titled “New Challenges of the Intraparty Diplomacy” on the initiative of the Conrad Adenauer Foundation and the Youth Organization of the Republican Party of Armenia. The three-day training course was organized for 20 young people from different districts of Yerevan. Karen Avagyan, Chairman of the Youth Organization of the Republican Party of Armenia (RPA) and Kristina Bellman, a researcher of the South Caucasus Regional Program of the CAF, presented the political education in the preparation of party staff in the form of such programs. The topic of the first lecture was the role of political parties in the state-building process, which was conducted by David Shahnazaryan. 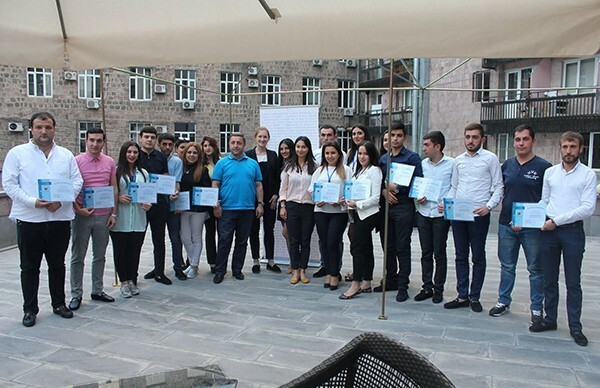 Under the supervision of Ashot Alexanyan, young people performed a practical work on “Communicating with Civil Society: Cooperation with Parties”. Subsequently, David Hayrapetyan presented to the young party activists the framework of thinking and mechanisms to counter them. During the meeting with the member of the RPA Executive Body Vigen Sargsyan the young people discussed the internal and diplomatic challenges of Armenia. Elina Asryan touched upon the issue of political myths. Hayk Mamikjanyan introduced practical examples of public speaking skills. Artak Zakaryan focused on the nuances of parliamentary and military diplomacy. The training was followed by a lecture delivered by Nvard Melkonyan. At the end of the program participants received certificates of participation.